Allergan CEO Brent Saunders said Monday the Irish pharma is considering a wide range of business options, including further divestitures or a split of the company, as part of a strategic review aimed at reversing two years of share price declines. “It is clear that there is a disconnect between our business performance and stock performance,” Saunders said on the April 30 earnings call, while noting that a large-scale combination or merger was an unlikely outcome to the review. Revenues in the first quarter climbed 3% year over year, buoyed by a 13% jump in sales of Allergan’s core products. Yet ​generic copies of the eye drug Restasis are expected to arrive this year and several inbound competitors could threaten Botox in migraine, putting pressure on expectations for future growth. 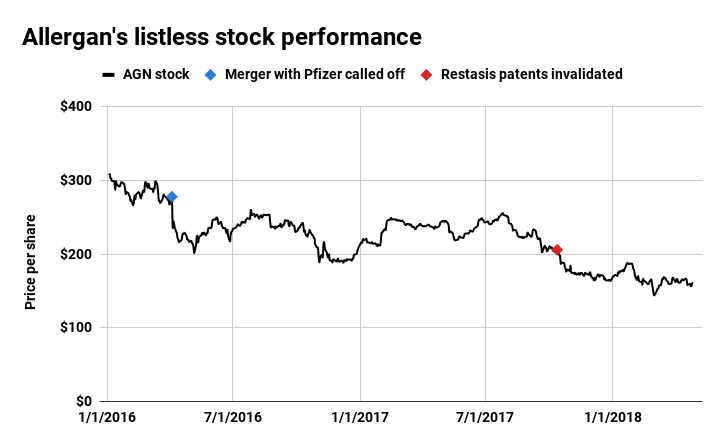 Since Pfizer and Allergan called off a potential $160 billion merger two years ago, the Irish pharma has suffered through a gradual erosion of its share price as questions mounted over the direction of the business. Built from an amalgamation of medical aesthetics and traditional pharmaceuticals, Allergan owes much of its current revenue to Botox (onabotulinumtoxin A) and Restasis (cyclosporine). Both, however, will likely face greater competition — a prospect likely on the minds of investors. Allergan argues its core business, focused on aesthetics, eye care and medicines for disorders of the central nervous and gastrointestinal systems, remains strong. Indeed, the company raised its sales guidance for 2018, forecasting net revenue to total between $15.15 billion and $15.35 billion on the year. Yet sliding prices for Allergan stock have frustrated shareholders, who have put pressure on company management to formulate a response. Earlier this year, Allergan took a step in that direction, announcing restructuring plans that cut 1,000 jobs and eliminated 400 open positions. The current strategic review could result in an even larger change to Allergan. Speaking on an earnings call with analysts, Saunders outlined five main business options that could include selling off units or splitting the company in two. “We do believe there are strategic and financial merits to a more focused Allergan and are currently evaluating options that would enable us to concentrate more on key therapeutic areas where we have the strongest competitive advantages,” Saunders said. The CEO indicated that he favored keeping the company largely as it exists today, but did acknowledge that the continued share price declines had spurred internal scrutiny. A split of the company would be the most disruptive and take the most time to complete of all the options currently under consideration, company executives said. “Although management continues to articulate that all options are on the table, we do believe that larger transactions have been for the most part eliminated from their thinking,” wrote Cowen analyst Ken Cacciatore in an April 30 note. Cacciatore forecasts strong growth from Allergan’s core therapeutic and medical aesthetic businesses, and maintains a $255 per share price target for the pharma. Shares in Allergan fell nearly 5% Monday morning, likely in reaction to Saunders’ comments on the call.